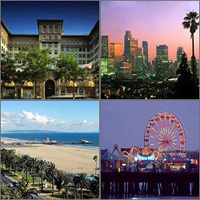 Compare discounts for Hotels Motels in Los Angeles, California! The City of Angels, the City of the Stars, Media Capital of the World, the largest sprawling metropolis in the US, Los Angeles is nothing like anything else. Only a century ago LA was a collection of small towns and villages located in a dusty basin on the shores of the Pacific. It has grown to become a city that offers everything to everyone. Unlike New York, where Manhattan is the center of everything, LA has no definitive center of attraction. The downtown area is the financial center but also offers tourist attractions; Beverly Hills and Hollywood are more entertainment oriented but are also frequent by business travelers. The beach towns of Santa Monica and Venice have streets you could actually stroll, but like other parts of the city, are mostly accessible by car. From Orange County in the south to the San Fernando Valley in the north and Pasadena in the West LA is a huge urban area with diversity like no other. Los Angeles is a challenging city, but it is also intriguing and exciting at the same time. The fully restored 1920s beach club reopened, after a major renovation, in 1999 as the Casa Del Mar hotel. It sits right on the sand, 2 blocks from the Santa Monica Pier. Viceroy Hotel is a Unique Santa Monica Hotel located by the Pacific Ocean Steps to the Santa Monica Pier and 3rd Street Promenade Minutes from Venice Beach, Malibu, Marina del Rey and Pacific Palisades. Shutters on the Beach is the only luxury hotel in Los Angeles nestled right on the sandy beach. The Radisson Huntley Hotel, Santa Monica Beach is ideally located in one of Southern California's most strategic areas, amidst an extraordinary montage of shopping, nightlife, culture and dining. The Marriott Manhattan Beach is located three miles south of Los Angeles International Airport and seventeen miles from downtown Los Angeles. It is just one half mile from Hughes Corporation and Manhattan Village Mall. The Omni Los Angeles Hotel at California Plaza is a modern hotel adjacent to California Plaza's corporate towers, and practically attached to the Museum of Contemporary Art. Located in the heart of the city's financial district, the Los Angeles Marriott Downtown is linked to the World Trade Center via a second-floor walkway and is one block from the Pacific Stock Exchange.